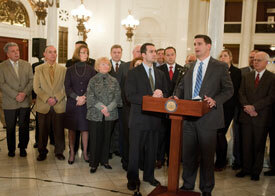 Rep. Tina Pickett joined a bipartisan coalition to announce legislation that seeks to reform the way business taxes are calculated in Pennsylvania. At the podium is Rep. Dave Reed (R-Indiana). HARRISBURG – In an effort to help employers create and keep jobs in Pennsylvania, Rep. Tina Pickett (R-Bradford/Sullivan/Susquehanna) this week applauded an effort to restructure business taxes in Pennsylvania. Pickett has co-sponsored legislation, House Bill 2150, to close the Delaware Loophole, a situation in which large industries establish a subsidiary in the state of Delaware and avoid or pay reduced Pennsylvania taxes. Instead, those companies that use the loophole would be assessed an expense add-back provision which already is used in 23 states. This change will allow for additional business tax reforms, including the gradual reduction in one tax and the way other taxes are calculated. so that a company’s CNI Tax liability would be calculated solely based on sales. encompasses a company’s sales, property and payroll. 6.99 percent over six years, a drop of 0.5 percent annually. the NOL carry forward that would help promote business investment and growth. Pennsylvania is one of only two states that currently limits the NOL carry forward.